Tonight’s the last night of Dodge City Days, the championship night of the rodeo, and the end of our western-themed drinks. Since there were actually some cowboys from Canada at this year’s rodeo (there usually are), I figured we’d use some of the whiskey from our neighbor’s to the north! A while back, I discovered Pendleton Canadian whiskey, and it has quickly become my favorite — beating out crown royal. It has a very sweet, almost dark rum like taste, and goes amazingly well in cocktails. I’m always eager to try suggested cocktails, as I tend to imagine those that distill the stuff have a pretty good idea what it goes with. I was able to track down Pendleton’s Website and dig up an interesting looking tipple called the Sagebrush. With a fitting western name, and the added bonus that we have sage growing in our backyard, I decided to close out the 50th anniversary of Dodge City Days with a solid, western sounding cocktail. Muddle sage leaf with orange slice in a mixing glass. Add your other liquids, shake without any ice, then pour into old fashioned glass filled with ice. 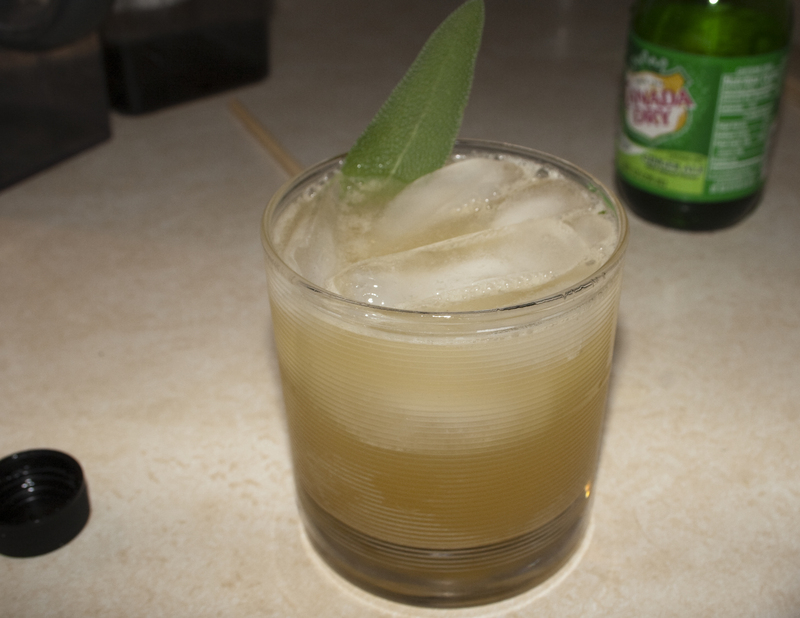 Top with ginger ale, garnish with a second sage leaf. Again, it’s nice to see when darker liquors make good light cocktails. It’s dark, but bright. It’s delicious.